The company has booked a plot of 114, 28 sq m in Phase 2 of the free zone as part of its development plans. 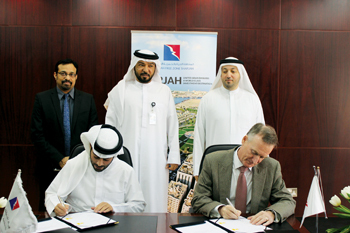 The deal was signed by Shaikh Khaled bin Abdullah Al Qasimi, chairman of the Hamriyah Free Zone Authority (HFZA) and chairman of the Department of Seaports and Sharjah Airport International Free Zone (Saif Zone), and Lamprell chief executive James Moffat. Lamprell has been active in the free zone since 2007 and operates a fabrication yard there. “The additional land has been leased primarily in order to construct new fully automated fabrication areas including pipe fabrication shops and blasting and painting sheds. This initiative, which forms part of Lamprell’s Project Evolution initiative, aims to increase efficiency and productivity. This increased focus on automation and yard optimisation is aimed at reducing pipe fabrication man-hours, improving safety, eliminating unnecessary material wastage and improving the quality of the group’s products and services,” a Lamprell spokesperson said in a statement. “With this additional plot, Lamprell now leases over 500,000 sq m of land including 1,430 m of quayside in Hamriyah Free Zone,” Lamprell added in its statement. “We are delighted to celebrate the growth of Lamprell as this move will enable them to grow further locally and internationally. We see this development as another example of our strategic goal of empowering businesses paying off,” said Saud Salim Al Mazrouei, director of HFZA and Saif Zone. Hamriyah Free Zone Authority is the leading hub for petrochemicals, oil and gas bunkering and storage in the UAE and a key force that attracts a large fraction of the foreign direct investment to Sharjah. Lamprell, based in the UAE and with over 40 years of experience, has established leading market positions in the fabrication of shallow-water drilling jackup rigs, liftboats, land rigs, and rig refurbishment projects, and has an international reputation for building complex offshore and onshore process modules and fixed platforms. The company employs approximately 10,000 people across multiple facilities, with its primary facilities located in Hamriyah, Sharjah and Jebel Ali, all of which are in the UAE. In addition, the group has facilities in Saudi Arabia (through a joint venture agreement). Combined, the group’s facilities cover approximately 899,000 sq m with 2.2 km of quayside. In one of its recent accomplishments, Lamprell last year completed construction on the jackup rig Jindal Pioneer and delivered it to Dev Drilling Pte Ltd of Singapore, a D P Jindal Group company, on time and within budget. The contract for the rig was signed in January 2013 and this was the second rig with the LeTourneau Super 116E (Enhanced) Class design which Lamprell had delivered to this client. The rig had been delivered following the completion of the first rig, the Jindal Star which successfully sailed away from Lamprell’s Hamriyah facility in Q4 2013 to be deployed in the Bombay High oilfield, run by India’s Oil and Natural Gas Corporation (ONGC), offshore India. Over the years, the company’s expertise has brought it contracts worth hundred’s of millions of dollars and global recognition for its capabilities in a very sophisticated sector. Lamprell received in 2014 a $370-million contract award from a subsidiary of Shell Drilling Ltd for the construction and delivery of two high-specification LeTourneau-designed self-elevating mobile offshore drilling platforms of the Super 116E (enhanced) class. The two jackup rigs, designed through collaboration between engineering and operations personnel from Shell Drilling, Shell Drilling’s customer and Lamprell, will be capable of operating in water depths of up to 350 ft and will be used in constructing wells with a maximum drilling depth of 30,000 ft. The rigs feature ‘fit for purpose’ offshore drilling technology as well as accommodation for up to 160 people. Lamprell began fabricating both rigs in its Hamriyah yard with delivery of the first rig marked for Q3 2016 and the second for Q2 2017. The rigs are meant for operations in Southeast Asia. Weeks earlier, Lamprell had bagged a $390 million contract from Ensco Intercontinental GmbH, a subsidiary of Ensco Plc, for the construction and delivery of two high-specification LeTourneau-designed self-elevating mobile offshore drilling platforms of the Super 116E class. The rigs are designed to operate in water depths of up to 340 ft with a rated drilling depth of 30,000 ft and will also incorporate a number of Ensco proprietary features and specifications. 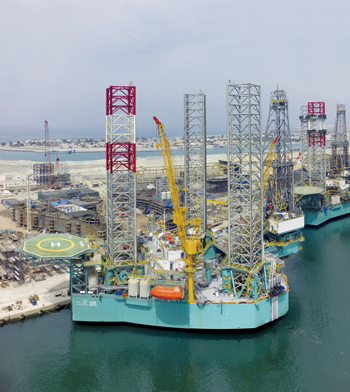 Lamprell is fabricating both jackup rigs in its Hamriyah yard. The first rig is scheduled to be delivered in Q2 2016 and the second in Q3, 2016. Two years ago, Lamprell constructed the vessel Hydra and delivered it to its client Seajacks. The vessel, assigned for operations in the North Sea, was the fourth that Lamprell built for Seajacks, three of which were constructed to the GustoMSC NG2500X design with the fourth vessel based on the larger GustoMSC NG5500C design. Following collaboration between Lamprell and Seajacks, the Hydra underwent substantial redesign resulting in an enhanced jacking system, an increase in persons on board from 90 to 100, and increase in main crane capacity from 300 tonnes to 400 tonnes and improved automation and space management. These vessels have been successfully developed to work in the harsh environment of the North Sea. “Such jackup vessels are flexible and multipurpose and capable of working both the offshore wind and the oil and gas sectors. All Seajacks vessels comply with the stringent regulations required to operate in the North Sea environment,” a Lamprell statement said. The contract for the Hydra was signed in July 2012 and delivery of this vessel represented the sixth jackup vessel of its kind to be delivered by Lamprell in total. Among Lamprell’s achievements in recent years are the delivery on schedule and on budget to Nexen Petroleum UK a production utilities and quarters (PUQ) deck for the Golden Eagle Area Development (GEAD) in the North Sea. It delivered the windturbine installation vessel Windcarrier 2 Bold Tern and its sister vessel Windcarrier 1 Brave Tern to the client, Fred Olsen. The vessels are operating in the North Sea.